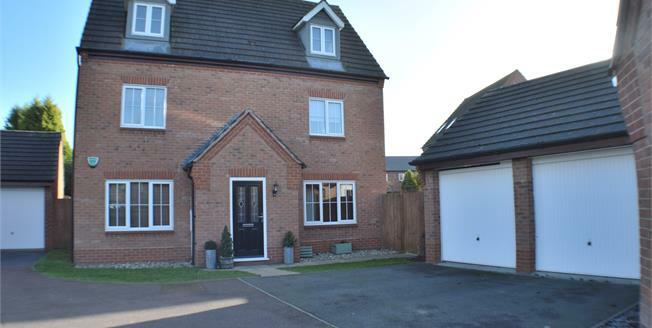 This exceptional 5 bedroom detached family home originally built by Bovis Homes is offered with NO CHAIN & boasts a splendid setting in an exclusive private cul de sac of just 3 properties with generous frontage, 2 car driveway, impressive detached double garage & large private established rear garden. The interior is presented to a high standard throughout featuring imposing reception hall, large guest cloakroom, stunning lounge, elegant dining room, impressively designed family integrated breakfast/kitchen with fitted appliances, spacious 1st floor landing with 3 excellent bedrooms, 2 en-suite shower rooms & principle bathroom, a stunning second floor dedicated to 2 double bedrooms, one with en-suite shower room. There is an exceptional plot with large private rear garden, extension potential, wide side entrance.